Beautiful, thank you for sharing both the writing and the image. Love this! I like this very much. The poem is delightful and uses wonderful imagery that complements the photograph beautifully. Thank you. The image came first in this case. It used to be that I would go out in search of something to complement a poem I had written. It’s wonderful how I see things that inspire my writing everywhere I go now. Very nice match up — words and image. Love your work! Thanks for liking the post on my photography blog today. Appreciate it! Thanks Danita and you’re welcome! Such wonderful gifts are those golden forythia blooms, decorating our pathways through the season on the way to full fruition of leavy shade for our refreshment. 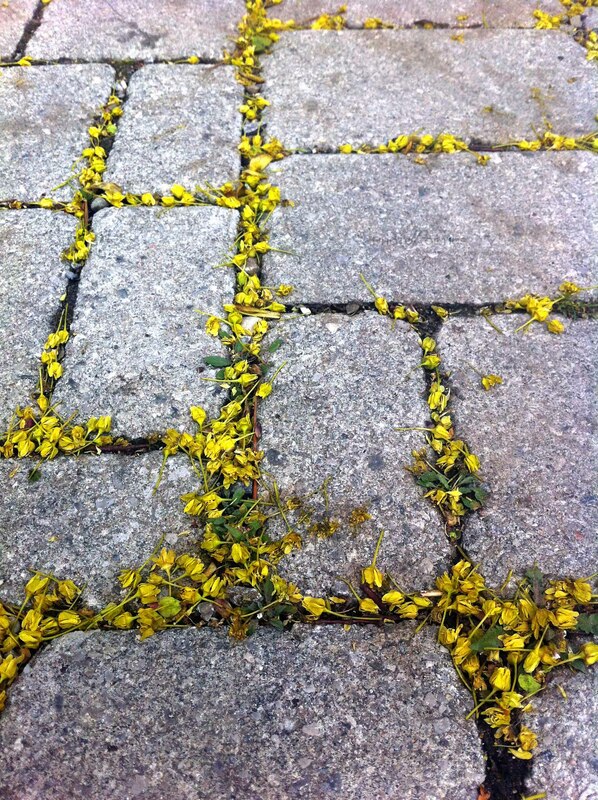 lovely poem, Tricia, I always feel a kinda sad when I see the blossom on the sidewalks. I understand exactly what you mean. They stay on the branches for such a short time as a signal that warmer weather is approaching that we sometimes miss the opportunity to truly appreciate them. A fine poetic statement of optimism! They were buds from trees that caught my attention because they were scattered everywhere. They do look like they’re growing up between the stones.